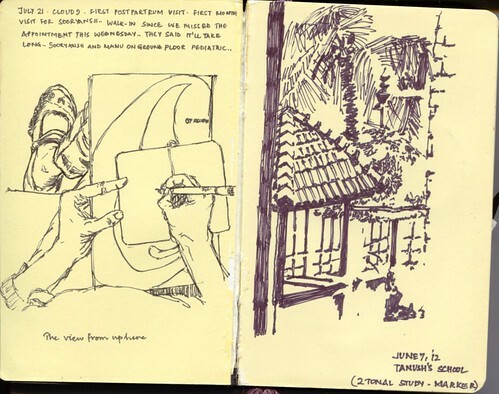 Precious Moleskine - Spread 1, a photo by teshionx on Flickr. Do you see a more recent date there? Isn't the moleskine supposed to be of the 2009 period? Oh yes!! That's because I didn't arrange them chronologically in the moleskine. The first page had scared me enough to leave it blank! Towards the end, I just wanted to fill in every bit of empty space! So there it is - the first page, the most daunting page, that got filled only much later in life.. A good picture for a first page.. I used mainly pen in this book.. All kinds of pen I guess.. The one on the right is a marker two tone sketch that I did while waiting for Tanush in his first week in school.. The first week required parents to drop their wards, wait for about 2-3 hours and then pick them back to go home. I spent most of my time with the moleskine and my Kindle..
That was the week before Sooryansh arrived!